A Hygiene products drive was conducted by Care To Help volunteer Justin Chen between April 13th and April 26th, 2016 in Freehold High School. Justin Chen, who is a student member of National Honor Society: Robert Friedman Chapter at Freehold High School, led and organized a donation drive under Care To Help Foundation to collect hygiene products such as toothbrush, and toothpaste, dental floss, mouth wash, bar soap, shampoo, and hand sanitizer. He coordinated the process of creating flyers, distributing flyers, collecting donation items, and packing these items with other members of Care To Help Foundation. 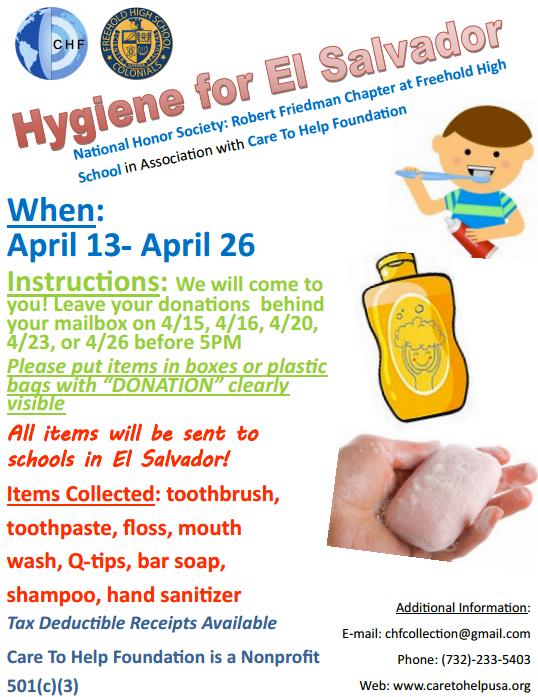 The hygiene products were sent to El Salvador, where a total of 352 students benefited from these donations.